How much extra gore is present in the unrated version of Part 3? I think that there was a deleted head exploding shot near the end when Reggie shoots that zombie point blank in the head with the super shotgun. BTW, I picked up the new Anchor Bay release of the 1st Phantasm film today at Circuit City for only 12.99. It came with an awesome poster as well and apparently one out of every 7 is signed by Don Coscarelli. I've had the original MGM special edition DVD that came out in 1999 of the 1st Phantasm film (which was just a port of the Elite laserdisc release) and had been perfectly content with that even though it didn't have anamorphic ehancement for the picture. I'm a bit disappointed that the Anchor Bay release didn't carry over all of the bells and whistles that made the MGM disc so great. The disco remix of the main them and Bill Thornbury performing a complete version of "Sittin' Here at Midnight" isn't on here as well as all of the wordwide press materials/posters. The commentary track on the Anchor Bay one is the same as well which is disappointing as Angus Scrimm had to re-record his comments due to microphone problems which makes his comments about twice as loud and doesn't fit in as a whole. The one great thing about AB's release is that the film has finally been anamorphic widescreen treatment and looks fantastic. I'm going to hang onto my MGM disc as it's been out of print for a while and use my Anchor Bay disc for when I want to watch the film. There was a fifth one? I've seen the first four, and my favorite, and actually the only one I enjoyed, was the fourth one. But, I must admit, the silver balls in the series of films has to be one of the greatest iconic images in horror films. I was just suggesting the slogan for the fifth one, if it were to be made. There is a new 36 minute documentary which is comprised of stuff from the 1 and half hour doc on the mammoth Region 2 box set. They mainly just used stuff relating to the 1st film. Phantasm - dirty, low-budget, "do the best with what they have", atmospheric mind-F*ck flick. Phantasm II - bigger budget, lots of action, four-barreled shotgun, Reggie becomes moviedom's least likely action hero, more blood, more balls, hopelessness and terribly marketed. The Evil Dead II of the series. Phantasm III - less budget than the last one, no Hollywood backing, spirals from cool into corny, child hero, pink hearse, too "cute". Bear in mindd, people, Menardd ddiddn't like Zarddoz. Oh man, my girlfriend picked up the boxed-set (though it would be more appropriate to call it a "balled"-set I guess...) for me for my birthday last year. Best. Gift. 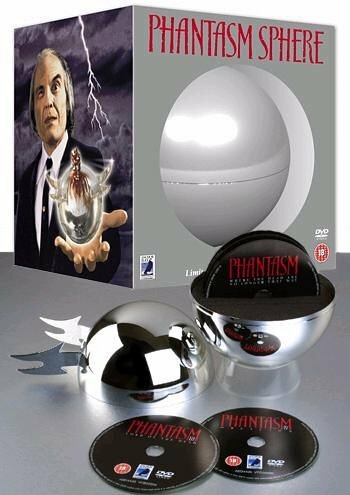 Ever... for two reasons: it's the only legitimate Phantasm II DVD I'm ever going to be able to get and, of course, because it's the coolest damn packaging EVER. Oh darn; now they'll all know I have good taste, mister double d.
I would say you have a one-gutter mind, Menard..
... but of course I'd be calling the gutters dirty, then. I watched the whole series in the wrong order (those days before owning a VCR), so my favourite is and probably will ever be #2, which is the first one I saw. It has everything! Lots of action, eerie atmosphere and a mystery that doesn't seem to need a final explanation. I watched #3 some years later, fun flick but yeah, pretty weak when compared to the rest. Then I finally saw #1 and liked it, but found it kinda slow. I saw #4 on Tv a few months ago. It's definitely an improvement over #3, it has a better atmosphere and it gives the impression Cosacarelli has a convincing ending for the series in mind. Still, the low budget and the poor pacing take their toll and ends up being rather unsatisfactory. I'd really like that Cosacarelli manages to get a good script and ends up the serie in a good way, before it's too late.